I'm also using sentiment stamps from Quietfire Design. A fabulous Christmas card with a wonderful quote. Thank you so much for sharing with us at Alphabet Challenge. 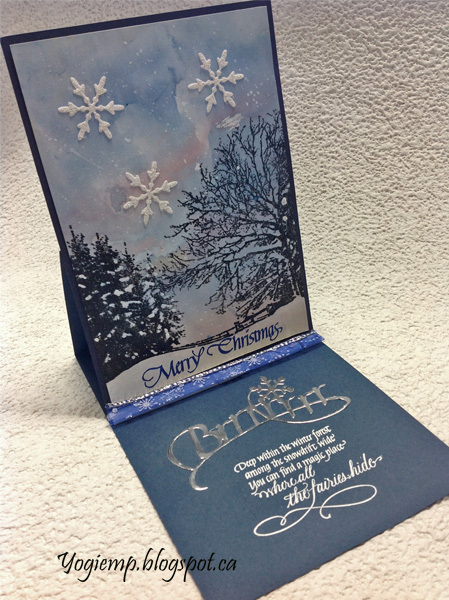 Lovely wintery easel card. Thank you for joining us at QKR Stampede. Stunning card Yogi! The gorgeous background is perfect for the trees! Thanks for joining our weekly challenge at QKR Stampede! Yogi, if you keep this up I'm going to have to go put a sweater on. 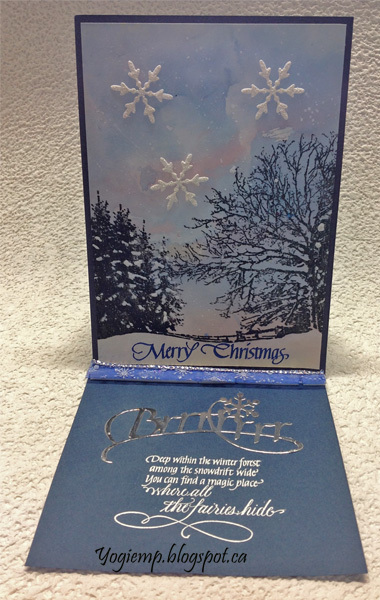 You captured all the quiet beauty of a snowy twilight or morning in this card. You're making good use of all your new stamps! Beautiful easel card, Yogi! Love those snowflakes. Love seeing you play in our "Anything Goes or Halloween" challenge at QKR Stampede this week. Hope to see you playing again soon.